The Bird Box Challenge: Have You Seen It? Home Fun Facts The Bird Box Challenge: Have You Seen It? Have you seen it? Sandra Bullock in a blindfold, the representation of Bird Box, is everywhere, and has already inspired countless memes! A wildly popular movie and still trending currently, not only has the movie made it to the meme world, but it has turned into a challenge as well. 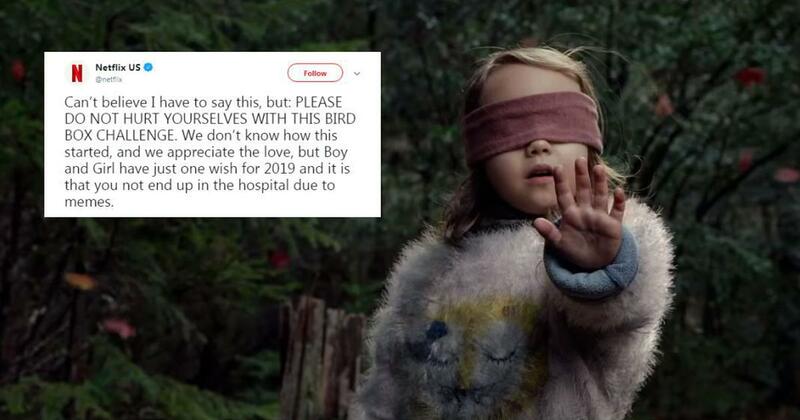 If you’ve seen the movie or at least know what it’s about, you can probably guess what the Bird Box Challenge is about. Hint: blindfolds. Now on Netflix, Bird Box is based on a 2014 novel of the same name, written by Josh Malerman. For those who haven’t seen the movie or would like to know what it’s about, here’s a quick synopsis for you. The story follows a woman and a pair of children who must make it through a forest and river blindfolded. Why, you ask? Well, there are supernatural creatures out there which are out to get them, and not seeing them is the only way of surviving. When one sees them, he or she hallucinates and finally commits suicide. With that, the Bird Box Challenge was born. What, exactly, is the Bird Box Challenge? It’s really quite simple. People film themselves performing their daily activities while blindfolded. Most are actually hilarious, but some have the potential to go horribly wrong anytime. For example, one of the latest news regarding this challenge was the teenager in Utah who drove blindfolded into oncoming traffic, causing her to crash her car. Next up we have the incredibly brave tattoo artist and his equally brave client, who agreed to a blindfolded tattoo sesh. At least no one got hurt in this incident, and the client got a few scribbles of ink instead of the face he was expecting. Take Off Your Blindfold to Watch! And if they aren’t enough, simply search “bird box challenge” on Google and/or YouTube, and you’ll get your fix of more videos! Blindfolding yourself and trying to do day-to-day stuff seems fun and funny, till it all goes wrong. Let’s go back to the teenager who crashed her car. Fortunately, no one was hurt in this incident, but imagine if someone was, or actually lost his/her life. Netflix has issued a warning to stop people from performing the challenge, especially in potentially dangerous situations. However, if we know netizens, this craze is far from over. We all love a little fun now and then, but remember to keep each other safe. You could still do the challenge, but choose more moderate activities such as feeding your other half, sweeping the floor, or simply just navigating around your house. We don’t want to sound like your parents, but make sure you have supervision regardless! Say Hi to Hai Di Lao in Malaysia!